Speedy the cheeky house bunny: Something was waiting for me and Mummy when she got home today! Something was waiting for me and Mummy when she got home today! 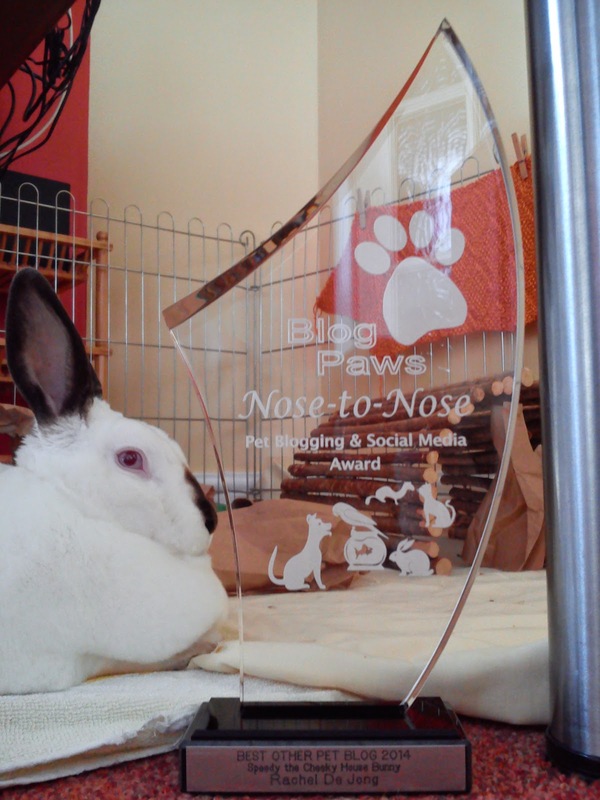 Yes that's write our Award from Blogpaws!!!!! Now we have to find a Special place for it! WOW That is some reward! Reward and Award ~ I did not finish my thought. Paws up, Speedy! I was wondering how long it was going take for your award to arrive. That is soooooo cool Speedy and we aew sure proud of you. Just think, we knew you before you were famous! Wow how very cool is that. We really want to get to go with Dad to Blogpaws some year. Woohoooo!!!! That's pawsome!!!!! It looks great! Congrats to the both of you! Truly *PAWSOME*!! Speedy looks so cute & proud! Woo hoo this is awesome! We saw the awards in person and they are beautiful. Where will you display it? 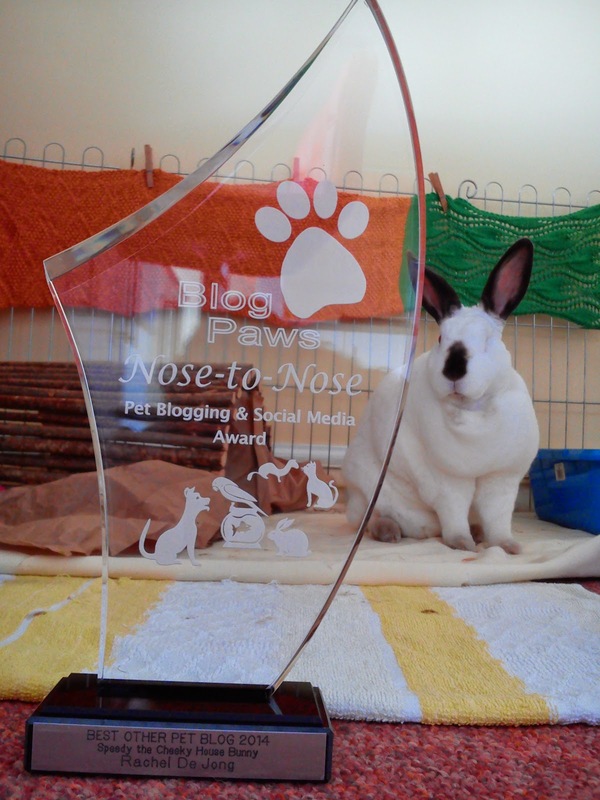 Congratulations on getting your BlogPaws award Speedy. WooooooHoooooo!!! CONGRATS Speedy!!! I was every so happy to hears you won!!! It is a most beautiful awardie!! And you look beautifuls modeling it! That's really nice. Congrats Speedy. Yeah your award! WooHoo WooHoo! How exciting, Speedy! It's a beautiful and very special award. It must be so exciting to receive your award Speedy! Nice one and we bet you are so proud of that lovely award. Have a wonderful Wednesday. That's so great!!!!!!! I'm so happy you won! I can't remember if this award came over the pond once, think you are the first from "the ole world", isn't that wonderful? You look so good next to your award. As usual ... we are late and sorry to be. Congratulation to you and to your Mummy Speedy. It's a nice and well deserved award. Oooooh, I am sure the perfect pedestal is out there. Of course, there has to be room on it for you and Speedy, too. Yahoo, you all! Well done Speedy and Rachel! what a lovely award! Congratulations! That is a FABULOUS award! I think you need to build a special shelf for your award... Because this is only the first of many awards to come! WOW! Congrats!!!! You guys definitely deserved it!